Of course nobody here is surprised to hear this but recently the warehouse club Costco used some Avery Weigh-Tronix ZQ375 checkweighers in the bakery. The results were impressive with great marks for wash down capability and weighing accuracy. Below is a case study provided by Avery Weigh-Tronix the maker of the ZQ375. Costco, the national Cash & Carry Membership Warehouse Club that produces and stocks a wide range of food products, has upgraded its scales to Avery Weigh Tronix’s new ZQ375 Checkweigher to achieve more accurate weighing for its bakery and confectionary ingredients. Costco has installed six ZQ375-30kg units at each of its newest warehouses at Leicester, Southampton and Farnborough and one larger, floor standing 90kg capacity ZQ375 for bulk weighing in the Butchery Departments. The equipment must meet stringent hygiene standards and must also precisely weigh a wide range of ingredients, from custard to food dye, to ensure a high quality final product. Featuring food-grade, fully stainless steel construction, the ZQ375 Checkweigher is a highly efficient solution for the food industry and beyond. From complete visibility of weighing data and statistics to fast, effective, simple checkweighing, the ZQ375 Checkweigher can help you to maximize performance and profitability while meeting strict legislative requirements. The ZQ375 is available from Central Carolina Scale located in Sanford, NC. If you’re shipping pallets loaded with smaller boxes then the chances are you’re using some type of shrink wrap or stretch wrap to keep the smaller boxes on the pallet. Some smaller companies use a stretch wrap roll and manually walk around the pallet themselves. However, many larger companies or organizations that ship out quite a few pallets typically use a stretch wrap machine to accomplish this task. One issue that can take place during this process is obtaining a pallet weight. Often the pallet has to be wrapped with stretch wrap and then moved over to the floor scale to obtain a weight. Now you can imagine if this happens multiple times each day, the lost time and inefficiency can really add up. A great solution for this is to add one of our large floor scales to your stretch wrap area. As you can see from the picture, the stretch wrapper sits on top of the platform scale and makes securing the pallet and obtaining a pallet weight a simple process. 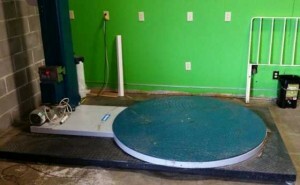 Custom floor scales for under stretch wrappers are available from Central Carolina Scale. Custom sizes no problem; standard pricing and scale is typically delivered within 4 weeks. Give us a call at 919-776-7737. Low profile and high capacity are standard features along with easy zero reset (on the Pennsylvania 7500/7600 indicators) for the dead load easily preserves full capacity and calibration.